Beards, boots, flannel and jeans. Over the past few months, you may have seen a new term thrown around — “lumbersexual” — and it looks like they’re becoming a real demographic among male consumers. Seen in New York, LA and everywhere in between, the Lumbersexual is bringing the outdoor industry’s clothing and accessories into the mainstream. Beards, boots, flannel, jeans or chino style pants, and a look that implies this is a guy who could make it at least a couple of hours with Bear Grylls. You get the picture. 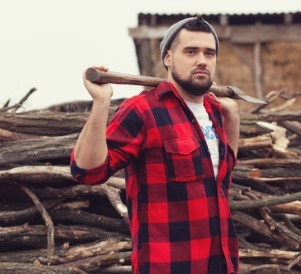 The Atlantic looks a little more closely at the implications of the lumbersexual. (Of course, the word “authentic” comes up a few times.) We’ll leave you to debate the questions of gentrification and “masculinity ‘in crisis’.” For our purposes, we’ll focus on how to outfit this new Paul Bunyon-esque lumberjack who roams the country. Maybe he doesn’t need an ax, but he does need all that flannel gear. And some loose fitting jeans to replace the skinny jeans he may have been wearing. And that beard is going to need a little grooming if it isn’t going to turn into a bird’s nest. And those rough-and-tumble boots. One of the places where men are getting these items is Land’s End. According to CNN Money, the company sold 450,000 pairs of handmade leather boots last year, a huge increase. A Fashion Institute of Technology professor says lumbersexuals like “durable, inexpensive brands” like Land’s End. But, the article says, Land’s End suffered from a 17 percent decline in stock price after some poor fourth quarter results. The brand may be having troubles due to its Sears association, but lumbersexuals could be the answer to their profitability question. And Land’s End isn’t the only brand that could benefit from this trend. Off the top of my head, I’m thinking Levi’s, Eddie Bauer, Eastern Mountain Sports and Patagonia might be a few others. And you know once something catches on, you start to get other iterations of it. So no doubt, we’ll be seeing Michael Kors or Ralph Lauren versions of these styles in the coming seasons for the high-end man who wants to look like his manicured hands can take down a tree.